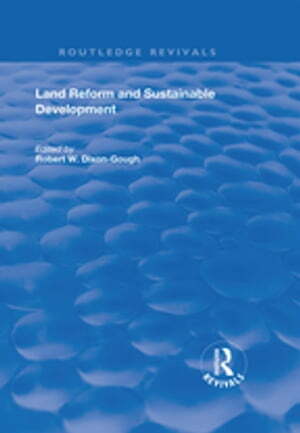 Collins Booksellers - Land Reform and Sustainable Development by Robert W. Dixon-Gough, 9780429767487. Buy this book online. First published in 1999, this volume is unique in that it gives a valuable comparison between the current state of land reform and sustainable development across greater Europe. The chapters are broadly divided into those related to the established systems of land reform and sustainable development encountered in Western Europe, and those which concentrate upon the evolving systems which are currently in the process of development in the former communist states of Eastern and Central Europe. The book is based on the papers presented at the 21st International Symposium of the European Faculty of Land Use and Development. The papers have been presented and peer-reviewed by some of the leading experts and practitioners of Land Reform in Europe. All papers have been extensively edited and revised, and are presented as chapters within the three sections of the book: Land Reform, Sustainable Development and Rural Land Development.